For centuries, the Chinese are regarded as pioneers in business. Ask a non-Chinese about a characteristic that best define them and you will likely receive this answer: good in business (the other is rich but that is the by-product of the first answer). Sometime in June, Forbes released its much-awaited 2012 Philippines’ richest. Not surprisingly, more than half of the 40 entries in the list were of Chinese descent, and not even critics can discount the economic value they contribute to the Philippines. To date, this phenomenon remains shrouded in mystery. What made the Chinese so adept in business? What made the Chinese become movers and shakers in business at all? The irony was that the Chinese never intended to become businessmen nor entrepreneurs when they stepped onto the Philippines let alone prosper from it. They were prepared to do anything. Historians and anthropologists agree that the Chinese venturing into business was about survival. But those days are long gone now. Today, the Chinese fosters an environment that allows the youth to grow up to become entrepreneurs just like previous generations. Fortunately, the community supports such environment and continues to cultivate and harness the entrepreneurial spirits of the youth. And count “CHInoypreneur” to support such cause. “CHInoypreneur” is an advocacy project of CHInoy TV, the country’s only trilingual magazine show. This project is co-presented by Multiply.com in cooperation with Philippine Franchise Association (PFA), Go Negosyo, Mansmith and Fielders and the Alliance of Filipino-Chinese Students (AFICS). Launched in 2011, CHInoypreneur aims to promote entrepreneurship among the youth and to help improve the current state of Chinoy-owned businesses by educating them with different tools, technologies, and strategies in the fields of leadership, marketing, finance, information technology and human resources that would enable them to compete with the bigger and more established companies. CHInoypreneur also aims to foster unity among the Chinoy community across different industries. CHInoypreneur will revolve around two main projects: the CHInoypreneur day and the CHInoypreneur Challenge 2012. The CHInoypreneur day is a one-day seminar that will be conducted by different business experts and will invite aspiring businessmen and even college students. Sharing their insights and expertise will be business gurus such as Samie Lim for franchising; Josiah Go for marketing; Randell Tiongson for finance; Paulo Tibig for basics of entrepreneurship and Michaelangelo Lobrin for business values. Meanwhile, the CHInoypreneur Challenge 2012 is a business reality segment on CHInoy TV that will have college students apply what they have learned from the CHInoypreneur seminar. Now on its second run, this year’s CHInoypreneur Challenge 2012 promises to be bigger and bolder, with collegiate students showcasing their entrepreneurial skills in a competitive challenge. Some of the participating schools are the De La Salle University, Ateneo de Manila University, University of Sto. Tomas, Philippine Cultural College, Chang Kai Shek College, University of the Philippines, and University of Asia and the Pacific. 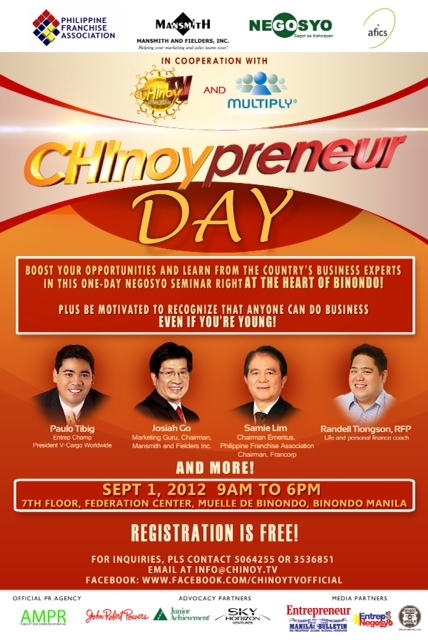 The CHInoypreneur Day will be held at the 7th Floor Federation Center in Binondo, on September 1, 2012. Don’t pass this opportunity to learn from the brightest minds of Philippines business, and get a sneak peek at how the CHInoypreneur 2012 business competition will unfold this year. Registration for CHInoypreneur Day is free. Just visit the CHInoy TV fanpage to register (www.facebook.com/chinoytvofficial).